Posted December 9, 2015 by Amie Barbeler & filed under Bar, Bar Food, Booze, Eat & Drink, Pub Bistro, Steakhouse. My approach to cooking steak usually involves buying whatever’s on special, overcooking it until it resembles old carpet, and then failing to rescue the taste by drowning it in tomato sauce. 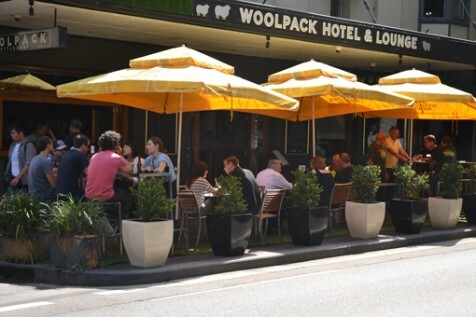 Since discovering this cool Redfern gastropub, my approach has changed… now I leave it to the professionals at The Woolpack to fulfil my meat cravings with a grilled slab of what I’m convinced is Sydney’s best steak. Seriously. Imagine steak so tender you can tear it apart with a spoon. Meat with a gamey depth of flavour that’s so full of taste it doesn’t require any additional sauces. 600 day old Hereford Red Beef raised in Orange that’s only $12 on a Monday… Do I have your attention? Jonesing for some iron, my date and I shared the delicious Chargrilled Scotch Fillet ($24) before spending the afternoon drinking Sangria ($12/jug) by the jug in the sun. Steak, sangria and sunshine: I’m sold.